Creating bubble diagram with free templates and examples. Bubble diagram has never been easier. A bubble diagram is a diagram which represents information visually in the form of a series of bubbles. Bubble diagrams can be used to compare concepts, identify areas of similarity and difference, present a wide variety of information for the purpose of activities like presentations, planning out designs, and developing strategy. One case in which the bubble diagram is widely used is in the development of plans for landscaping and architecture. The bubbles can be used to represent different kinds of spaces in a plan, varying in shape to represent features of greater or lesser importance and size. The bubble diagram can create a rough sense of flow which is used to develop a more refined plan. Moreover, bubble diagram is a diagram with a bubble presentation of data and the size of a bubble is a parameter of data, too. 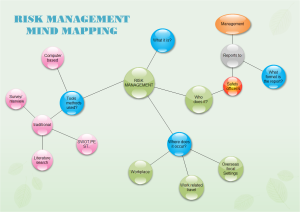 For example, it can display the importance of the data in diagram or its value. So you can operate three parameters on 2-dimensional diagram - X and Y coordinates of a bubble and its size. 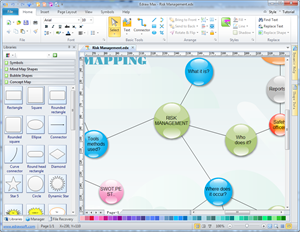 Edraw is rather a lightweight yet incredibly powerful diagramming tool, which helps you create Bubble Diagram in the easiest way. It contains a large collection of shapes and examples, as well as an intuitive interface and automated tools, which helps you design and customize the drawing with free templates. All the beautiful diagrams you have designed can be easily exported and printed in a strict correspondence with the screen picture. A risk management bubble diagram template is ready to use in vector format for your own designs. 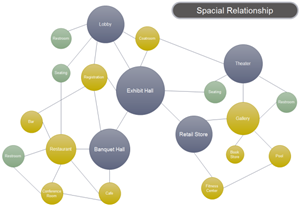 Use a bubble diagram to represent the spatial relationship for architecture design. Click the image to download the template.